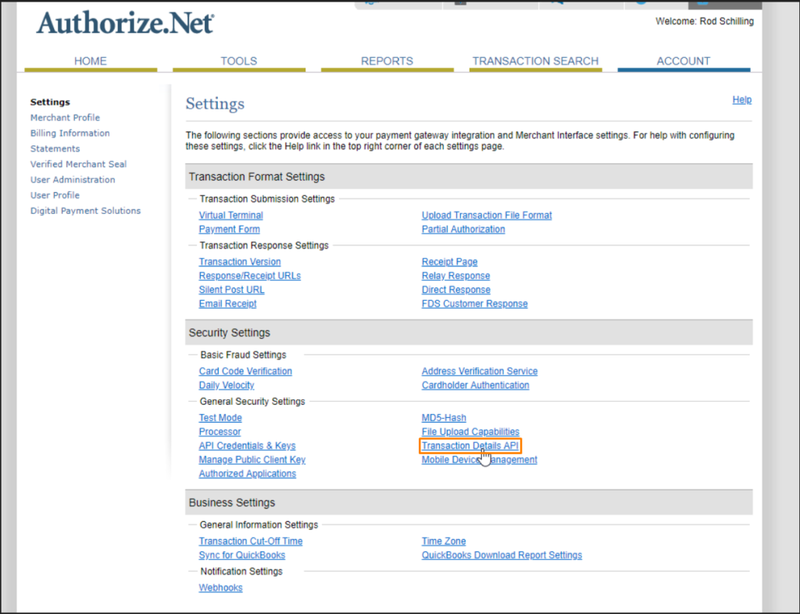 This is a step by step breakdown on how to do Authorize.Net Integration with the system for your company payments. Go to https://sandbox.authorize.net/ and log in with your Authorize.Net credentials. Click on the “Settings” button at the bottom left of the page, highlighted in orange in the picture below. An important thing to note is to check if your account is on the test server or live server. You can do this by clicking on “Test Mode”, highlighted in orange in the picture below. Once you clicked on the button, a new page will appear which will tell you if you are in test mode or live mode. You can toggle the button to suit your needs. Head back out to the settings tab and click on the “Manage Public Client Key” button, highlighted in orange in the picture below. You will see the Client Key, highlighted in orange in the picture below. You will need this key in a later step. Click on the “Settings” button on the left menu, highlighted in orange in the picture below. to head back to the Settings page. 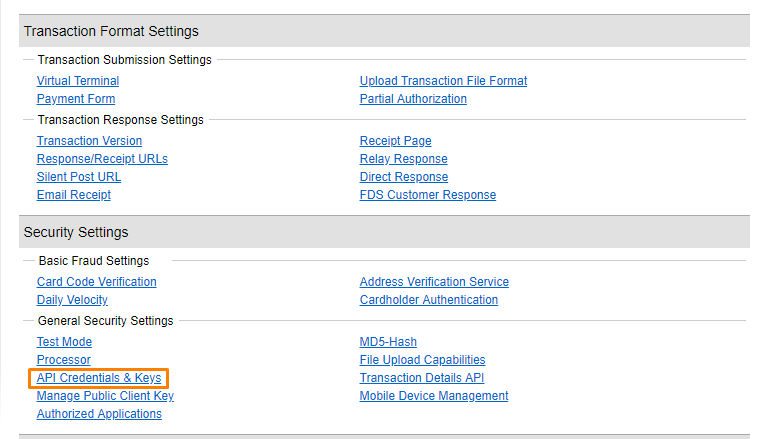 Next, click on the “API Credentials & Keys” button, highlighted in orange in the picture below. You will see the API Login ID, highlighted in orange in the picture below. You will need this key in a later step. At the bottom of the page is a Create new Key function, highlighted in orange. This is where you obtain your Transaction Key. Enter your Secret Answer to the question. Next, select the radio button “New Transaction Key” and check the “Disable Old Transaction Key Immediately” box. Next, click on the “Submit” button. Once you have clicked on the “Submit” button, a new page will appear. That is the transaction key. You will need this key in a later step. 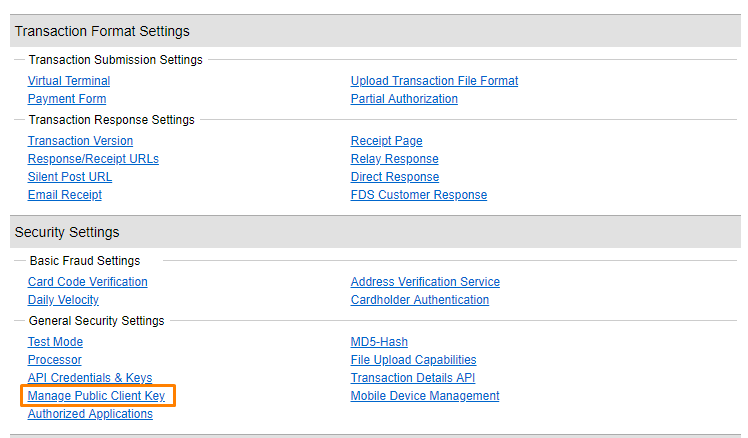 Navigate to Settings once again and click on Transaction Details API, highlighted in orange in the picture below. 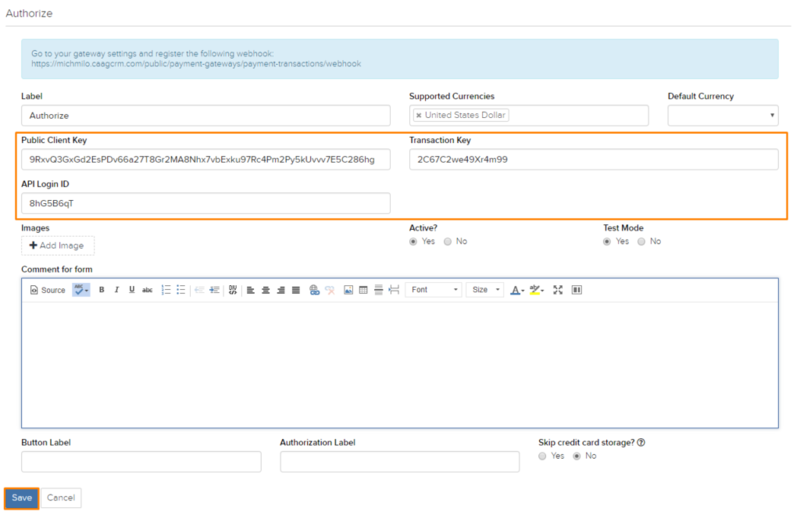 Make sure that the Transaction Details API has been enabled, as shown in the picture below. Next, set up a new gateway in the HQ system. Go to Settings > Payment Gateways > Gateways > Add Gateway and select Authorize. Fill in the necessary fields which are Label, Supported Currencies, Public Client Key, Transaction Key, and API Login ID. 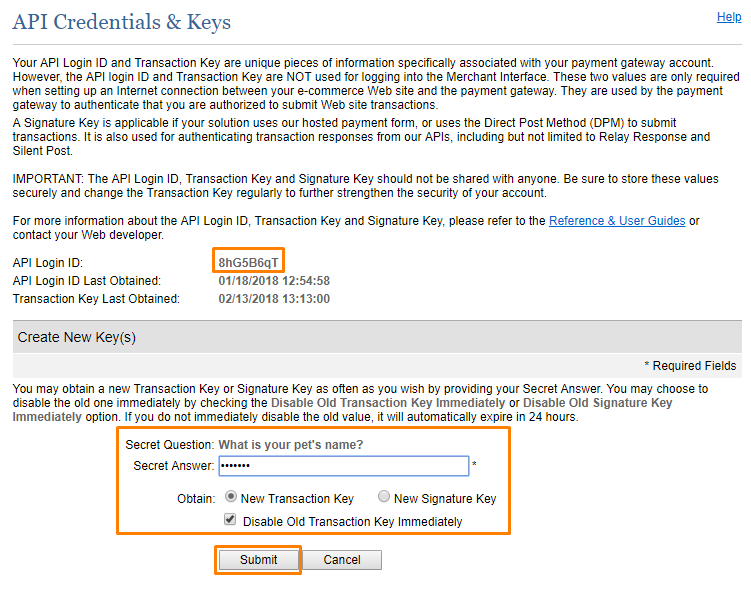 Public Client Key is obtained in step 3, whereas Transaction Key and API Login ID are obtained in step 4. 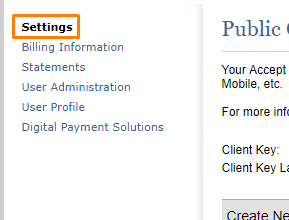 If you are testing the payment gateway, make sure that the Test Mode radio button is set to Yes. When you are done entering the details, click on the blue “Save” button. If your company supports multiple currencies, you would need to complete this step, if not, skip to step 9. Next, a new window will pop up, select the payment method, in this case, is Credit Card and click the blue “Save” button, highlighted in orange in the picture below. Lastly, a new row will appear, in the currency dropdown list, select the currency that you are supporting and click on the blue “Save” button, highlighted in orange once you have finished. 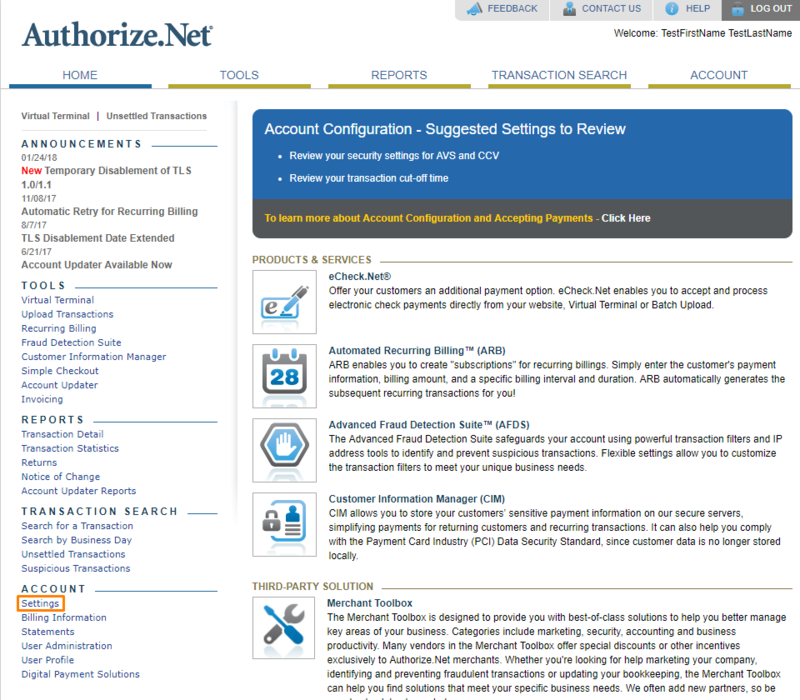 Next, you will need to select Authorize.Net as the supported payment for your brand. Head to Settings > Fleet > Company Brands and select the brand that you want to use the Authorize.Net integration with. Scroll down till you reach the Financial Specifications category and under Supported Payment Gateways, add in the created Authorize.Net gateway to conclude the setup.